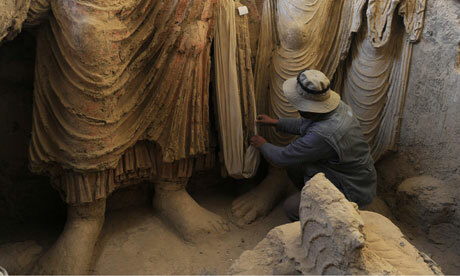 AFGHANISTAN – Mes Aynak - The forts and temples of the ancient Buddhist town at Mes Aynak in Afghanistan throng with the biggest crowds they have seen in more than 14 centuries. Nearby, rows of sheet metal housing built for Chinese miners are almost empty. Hundreds of archaeologists are working at the site to excavate gilded statues of the Buddha, elaborate stupas that rise from ornately carved floors and delicate frescoes protected by centuries of mud and forgetfulness. The rich vein of copper that once funded Mes Aynak's creation is now likely to bring about its destruction: a Chinese state-owned mining company paid $3bn for the extraction rights, and the site will eventually become the world's biggest copper mine. But while the fevered excavations are a thrilling sight for those racing to save the last traces of Mes Aynak, the lack of activity in the mining camp is alarming financial mandarins in Kabul, who are counting on mining revenue to make up for slowing streams of western aid. Instead, the only excavation on the site is of archaeological treasures and even the most optimistic officials and analysts admit it will be two years before Mes Aynak copper is trucked off to a Pakistani port. However, others think 2016 or 2017 are more realistic, after a series of setbacks. The Chinese camp was evacuated last summer after a Taliban rocket attack and shows no signs of being restaffed, the ministry of mines wants to renegotiate the multibillion-dollar contract for the site, and the archaeological dig that must be completed before mining starts is still in full swing. FRANCE – Muret - Aucune révélation sensationnelle n'a jailli sous les pelleteuses, mais comme le dit Christian Salmon : «Nous n'avons rien trouvé, mais c'est ce que nous n'avons pas trouvé qui est intéressant». Pas un seul bout d'os, ce qui signifie qu'il n'y a pas de cimetière et qu'il n'y en a jamais eu, car des traces de tombes et de fosses auraient été conservées. Et pourtant, nous sommes au chevet de Saint-Jacques et l'on sait que les cimetières primitifs entouraient les églises. «Mais il se peut que le cimetière commence plus près de l'église» tempère l'archéologue qui ajoute : «Nous n'avons pas sondé sous la route». Deuxième déception : «On pensait trouver des habitations du moyen-âge. Or, les murs les plus anciens datent du XIVe et XVe siècles. Les quelques témoins de céramique que nous avons analysés concordent avec cette époque». La maison à colombages qui abrite le restaurant La Bohème témoigne de cet urbanisme. Donc, en 1213, au moment de la bataille de Muret, l'emplacement était en dehors du bourg. Les sondages ont révélé quelques caves et un mur transversal qui longe la rue Clément Ader, sur lequel des constructions modernes sont venues s'appuyer : le cadastre du XIXe siècle en atteste. Les sondages ont été rebouchés avec du granulat. ISRAËL – Lod - One of the most exceptional and well-preserved mosaics ever to be discovered in the Holy Land is now on view in the world’s most visited museum. On Thursday, May 22, the mosaic from Lod, Israel went on display at the Musée du Louvre. Located in a new exhibition area devoted to the Roman Eastern Mediterranean, the Lod Mosaic is presented side-by-side with the Four Seasons Mosaic from Antioch. The beautiful and elegantly crafted third-century A.D. mosaic, which is festooned with lively depictions of wild beasts, birds and marine life, was discovered nearly 15 years ago during roadwork near the town of Lod just south of Tel Aviv, but it had to be reburied until sufficient funding was found to properly care for the remarkable piece. 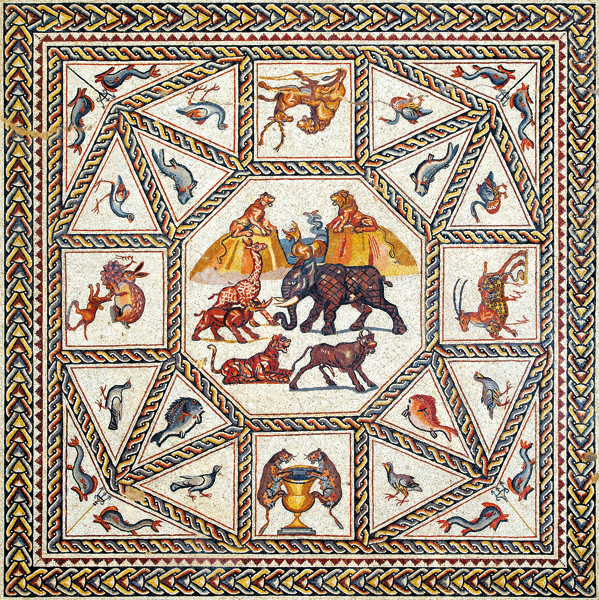 a grant from Shelby White and the Leon Levy Foundation has finally allowed the Israel Antiquities Authority to excavate and conserve the mosaic’s brilliant panels, including this impressive 13-foot-square mosaic carpet (above), that may have once adorned the main audience room of a luxurious Roman villa. The stunning mosaic features an intricate lattice of square and triangular scenes of various birds, fish and game animals surrounding a central octagonal scene showing some of the ferocious and exotic animals—a lion and lioness, an elephant, a giraffe, a rhinoceros, a tiger, a bull—that the villa’s wealthy owner may have supplied to the staged hunts and gladiatorial contests that were so popular during the period.